An engine problem with Kimi Raikkonen's car is threatening to end the F1 star's remarkable WRC debut on Rally Finland. Raikkonen brought his Abarth Grande Punto S2000 through SS16 in fifteenth place overall, and is placed third in the Group N class, but before heading back to the Service Park the Finn said all was not well with the car. "We have big problems with the engine - there's no power," explained Kimi. "Also we broke the front suspension when we went too much over a jump and that means we have no damping. We'll try and get the suspension fixed in service but unfortunately I don't think we can do much for the engine. We'll see how long it goes for." The car made it back to Jyvaskyla, where Raikkonen's co-driver gave a frank mechanical update before checking into the Tommi Makinen Racing service area. «E chi lo sa. Gli dici bravo, ti risponde thank you. Gli dici che ha sbagliato, ti risponde thank you. È la sua forza, è il suo limite». Ferrari are reportedly 'open' to the idea of Michael Schumacher replacing Felipe Massa for the rest of the season. Although the German's return to F1 must, at this stage, be considered more unlikely than likely, he continues to feature prominently on what is a very short list of potential replacements for the stricken Massa. 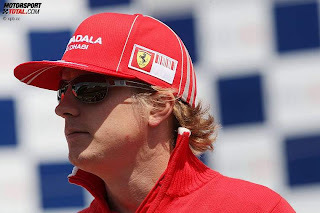 According to The Times, 'The team have three reserve drivers on their books in addition to Massa's team-mate, Kimi Raikkonen, in Luca Badoer, Marc Gené and Schumacher, the seven-times world champion. Massa’s Ferrari team-mate Raikkonen took a similar stance to Webber, pointing out that open-cockpit cars inevitably expose drivers to some risk of head injuries. “It was really a very, very unlucky situation where he [Massa] ended up,” said Raikkonen. “As long as we race with open cockpits our heads are always in the worst place, the first place that’s going to be hit if something’s flying around. “What happened was really unfortunate but luckily enough he’s more or less okay. “He’s probably going to be a hundred percent fine in a little time. “We in the team all hope that he’s going to be fine and come back soon. McLaren team principal Martin Whitmarsh agreed that Massa was the victim of a rogue sequence of events, but insisted there must be no hint of complacency in the sport’s reaction to his accident. Q: Kimi, it’s been a long time since we had a McLaren versus Ferrari at the front. Tell us about your race. Kimi Raikkonen: We got a very good start. That definitely helped. We knew before the race we needed to gain some places at the start to be able to fight for the podium. I was only fourth after the first few corners behind Lewis and then he overtook Mark and I could follow Mark and we went at the same time for the first pit stop. Then I don’t know if he had some issues or not and I got past him at the pit stop. After that really I was just driving my own race, trying to catch Lewis. I thought I had the speed for that at one point but then suddenly he started to go the same speed and then a little bit faster. The gap more or less stayed the same the whole time. Then I had some issues on the last pit stop and that didn’t help either but we had a good race. We knew that it would be difficult to challenge for the win right now. We were probably closer than we expected, so even with not such an easy weekend for the team, but we have got some good results, so hopefully that is something we can keep going like this and it is something positive at least this weekend for the team. Q: Kimi, tell us about the moves you made at the start which came up on the board that will be investigated after the race. How did you see it? KR: I don’t know about the whole thing, so if you can tell me what it’s about that would be nice. Q: Off the start line into the first corner and the incident with Vettel? KR: I haven’t even noticed if I touched somebody. I was in-between, I think, Mark and somebody else but I don’t know what is going on. That is the first time when you told me but I didn’t feel any touching or anything, so I cannot comment on that. Q: Kimi, first of all you were nearly hit by Mark Webber at the first pit stop; did you see him coming out? KR: Yeah, I saw when he came out. I took a little bit more space on the left hand side, so I was pretty sure that they would tell him that I was coming. I don’t know how close it was but I saw him and I gave him all the space that I could. Q: What about your own second stop, you seemed to lose time there? KR: Yeah, we probably had some problem, and we needed to do a manual pull-away and then it went on to anti-stall, so it was a bit confusing but I just took it easy because I knew that we had enough time from behind, we were not in a hurry, so it took much longer than it should. It’s always a bit difficult if you cannot make a normal proper pit stop with a proper start. When you try to make a manual pull away it can easily go to anti-stall, so that was the issue today. Q: And generally speaking, how was the car? KR: It was OK, nothing special. We had some issues in a few places, we knew that before. They had been there almost the whole weekend. We were a bit limited by what we could do this weekend. Overall, we still had good speed but I think we could have had better speed. It’s nice to be second, for the team and for all the people who have put in a lot of effort and it hasn’t been an easy year or an easy weekend with Felipe’s accident yesterday but we need to be happy. We knew that our car was probably not the fastest one but we still got a good result, good points. It was good but not exactly what we wanted. You are never going to be happy unless you’re in first place, Hopefully we can keep up this kind of speed and try to get good podium finishes and hopefully get at least one win this year. Q: (Ian Parkes - The Press Association) This is to all three of you: I was just wondering how much the day has been overshadowed in some respects, given what has happened to Felipe and his current condition at the moment? KR: It’s the same story. It was really a very, very unlucky situation where he ended up. As long as we race with open cockpits our heads are always the worst place and the first place that’s going to be hit if there’s something flying around. What happened was really unfortunate but luckily enough he’s more or less OK. He’s probably going to be a hundred percent fine in a little time. We in the team all hope that he’s going to be fine and come back soon. This is a part of racing and we all know that. It’s just a sad thing to happen. Stefano Domenicali assures that Kimi Räikkönen will continue according to his contract with Ferrari next season. - We have a contract, Domenicali confirmed to MTV3. The Spanish reporters have been busy spreading the rumour of Alonso going to Ferrari. - We have heard this kind of speculation already for four or maybe five years. It's something that belongs to the spirit of the F1-game. In every sport they try to mix up the others balance. The most important is that we keep our focus in our work as a team. 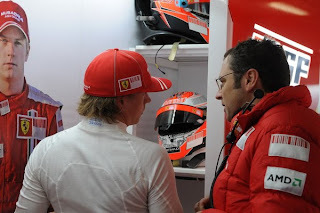 Kimi is part of our team, Domenicali said. Kimi Räikkönen’s skills behind the wheel in a rally car and as a test driver continue to amaze the F1 champion’s co-pilot, Kaj Lindström. On Monday Räikkönen started two days’ testing session before the July-August’s WRC Rally, which he drives on a Fiat’s Super2000 car. - As watching that speed, I have to lift my hat. Everything points to a super talent on a car handling. The car is all the time controlled by the driver, Lindström says after the test day. Räikkönen has driven rally on snow and asphalt. The WRC Rally that is driven on fast gravel roads in Middle Finland is the first gravel race in his career. When Räikkönen goes for the first leg he has approximately 300 test kilometers driven on gravel. - As a challenge, the race of Jyväskylä takes a whole new level compared to the races driven this far. It’s already like this because it’s the fastest rally in the world and it doubles Räikkönen’s experience in rally, Lindström is calculating. Räikkönen’s main challenge is the noting of the route. His note language comes from an ex pro Tapio Laukkanen and Lindström who made the notes for him in Tunturi rally. Lindström believes that the noting won’t bring problems. Surprisingly easily the road goes into a note by Kimi even though he has a little of experience. It’s not perfect but neither are the notes by the top names in rally, Lindström reminds. 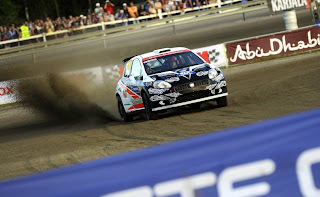 To make Fiat suitable for Middle Finland’s fast gravel roads Räikkönen has received help from a former champion Tommi Mäkinen. Kimi is a highly professional in tests too. While driving when he told that the front is doing this and that, and when Tommi is testing the car, he gives exactly the same feedback, Lindström says. Super2000 car doesn’t have unlimited setting opportunities. In the tests the behavior of the car is changed by adjusting the suspension and differential locks. The goal has been to find a logical package, a car that is not doing any extra moves. At the same time it’s been tried to give Kimi an opportunity to search for a feeling and routine for the car and gravel. Räikkönen’s tests still continue for one day. The WRC Rally of Finland starts in Thursday, 30th of July from Jyväskylä. Singapore, September: To commemorate the first night race in the world, TAG Heuer launched a limited edition of its premium Grand Carrera series at 150 pieces only. In line with the unique night race format, this special Grand Carrera has been developed especially for Singapore, available only in a limited edition of an all-black bezel, dial and indexes to signify the night race. As part of a meaningful collectible, each exclusive timepiece is presented together with a limited edition book titled “Snakes and Devils”, compiled and authored by motoring enthusiast, Eli Solomon. The book pays tribute to the history of the Singapore Grand Prix. It was, after all, a terrible day for Force India's Adrian Sutil, who ran as high as second before his first refuelling stop, but then lost it all through a clash with Ferrari's Kimi Raikkonen as he exited the pits. He needed another stop for a new front wing and finished a tearful 15th, behind Renault's Nelson Piquet and BMW Sauber's Robert Kubica. Stewards looked into the Raikkonen incident, but decided no action was necessary. Kimi Räikkönen's manager Steve Robertson rejects the stubborn rumour that Ferrari would replace Kimi with Alonso after this season. - Those talks are pure BS, Robertson said to MTV3 on the telephone. - These rumours have been going on for a while. Some quarters seem to have a habit of coming up with unjustified rumours and the magazines again want to write. A lot of the rumours come from Spanish reporters but as I said, there's no truth in them, Robertson continued. Robertson didn't want to speculate if the group backing up Alonso could be behind the rumours. - I don't know who is behind them but I can only assure that Kimi has a contract for the next season. 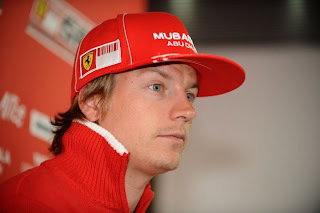 Kimi is happy at Ferrari and he wants to drive for Ferrari. Robertson says that Räikkönen is committed 110 % to continue his career in F1 and Ferrari. - He has a contract with Ferrari and he will drive there, Robertson assured. The circus around Kimi Räikkönen is a good example of how fast the same F1-news travel from one media to another and changes it's form at the same time. 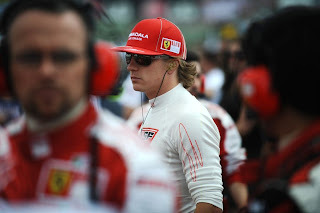 The rumour mill went strong again last week's Wednesday when Italy's biggest sport magazine Gazzello dello sport speculated that Räikkönen will have to give way for Alonso next season. The rumour in itself isn't new, especially the Spanish media has been drumming for the same thing for a year already. It did give it more credability that behind the article was F1-reporter Pino Allevi who is told to have good relationships with Ferrari. In order to sell magazines IS Veikkaaja brought today the same news up in the front - having Gazzetta dello Sport and Allevi as it's sources. The Finnish media went along this news fast as a flash so that Räikkönen's team don't have time to disagree with it. It didn't take than 3 hours for this sensational news to run back to Italy. 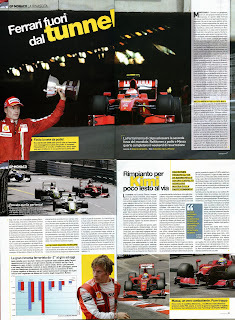 'The Finnish press: Kimi will leave the F1-circus at the end of this year' La Stampa for example told on their website. 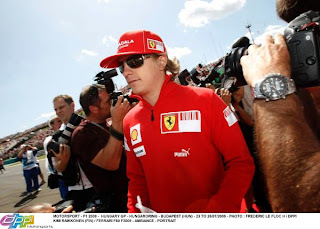 'Kimi says goodbye to Ferrari and F1' Sportal-website again declared referring to Veikkaaja. Sooner or later the same news ends up on the English and the Spanish websites - and will get a more dramatic tone. 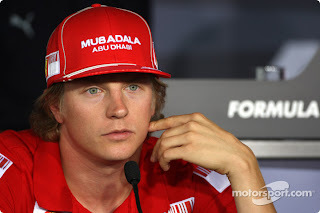 Although I'm not anymore ready to bet my whole fortune for Kimi continuning in Ferrari, it's reason to keep in mind that the kick-rumours still haven't got any new facts to back them up. 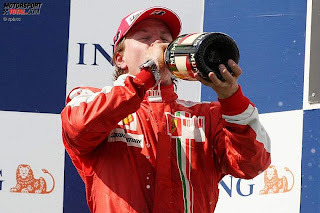 The cold ride in the rumours about Kimi Räikkönen being smoked out from Ferrari already next season will probably grow even bigger in the Spanish and Italian media when the 2007 WDC is now in his sixth pointless race during the season. Räikkönen stopped the German GP after 34 laps. The reason was a stone on lap 14 that left a big hole in the cooler because it pierced the side pontoon's safety net. That again caused a leakage of fluid which again lead to weakening engine powers. Räiikönen stopped the race before the engine broke down. According to the rumours Ferrari will publish that Alonso will come to Ferrari in Monza on September 11th? – Don't believe in rumours like that, Domenicali says and pats me on my shoulder. Can you clarify Kimi's situation? – There is nothing new. I'm sure everybody remembers last year. Back then this rumour was exactly the same, Domenicali explained. Then why does so many seem to have definite information about Alonso's contract with Ferrari? – Believe the team and the facts, not the rumours, Domenicali said. 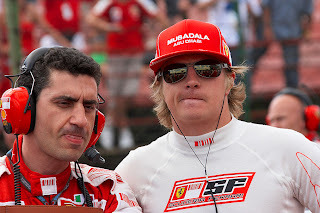 Domenicali is a team principal but the driver contracts are made by Luca di Montezemolo. He is known to appreciate Alonso highly while Jean Todt again didn't want the Spaniard to Ferrari. 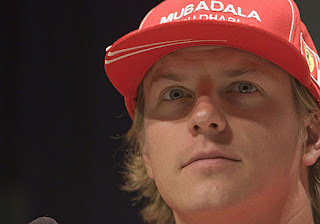 In the press conference Domenicali was asked if Räikkönen's performance so far had been sufficient. – One has to be careful while analysing the performance of our drivers. One has to take into consideration the car's situation and the tyres' situation. Our approach is that you never hear the team complain about one single engineer or driver. We only talk about our team's performance and the drivers are part of the team, Domenicali said. – The most critical element this season is to understand what happens to the car on different tracks in different temperatures and with different tyres. The situation seems to be the same in every team. Now we did a good job but our competitors aren't sleeping either like the rise of Renault, McLaren and Force India proved. Lewis Hamilton lost the race because of a tyre puncture and Renault made a spectacular laptime in the end of the race, Domenicali summed up. The Finnish formula ace has a secret admirer in the top of the world's music scene. To Britney, 27, formula 1 is not an unfamiliar sport. She reveals in Iltalehti's interview that she has followed F1-races few years ago. At that time a certain blond Finnish viking stayed in her mind. - I noticed that Finns dominate motorsport. Kimi Räikkönen is a true fighter and moreover really cute, Britney compliments. I get more and more fellow reporters whispering in my ear in Nürburgring's press room that there's some driver-news to be expected from Ferrari this year. If you take them seriously it feels like Fernando Alonso is going to take Kimi's place in Ferrari - and already next season. When I had a private interview with Kimi on Thursday I asked for the truth and got the assurance that nobody from Ferrari has even hinted to him that his seat might be threathened. 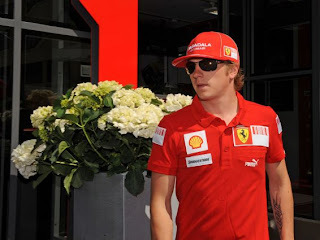 Kimi signed a granite-hard contract for 2010 with Ferrari's president Luca di Montezemolo on Friday September 12th 2008 at 12.10 in Ferrari's garage in Monza. The team confirmed it the same afternoon. 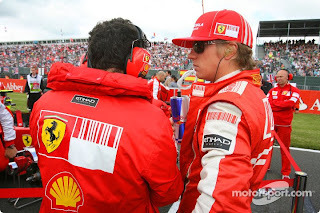 After that Ferrari has been grinding their sponsor contract with the Spanish Banco Santander to begin from year 2010. In order to honour this event Ferrari is for the first time arranging their Ferrari-day on November 15th outside Italy on Valencia's track in Spain. Even though the Ferrari-fans – the tifoso – are mostly Italian and the Ferrari-day is meant for them. However Luca Colajanni assured that there are Ferrari-fans all over the world and the event could as well be held in for example Helsinki. The atmosphere within the team isn't of course the highest at the moment when Ferrari is for the first time in 16 years facing no victories at all. But Räikkönen isn't treated like some outsider there. Nothing implies that the countdown would have started. If Kimi's contract would be broken it would mean that the 2007 WDC would still get a huge salary - according to estimates about 30 million euros. As a matter of fact it would be taken away from Santander's millions. In a way Ferrari would save Kimi's salary if Santander would first pay the Finn out and then also stand for Alonso's salary. Räikkönen would not fall on nothing in that case. 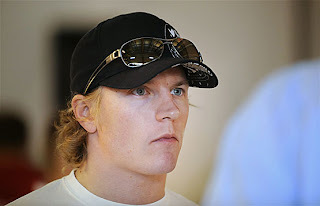 There are still several teams who now closely follow the possible release of the Finnish driver to the drivers market. A year ago many thought Jenson Button was an ex-driver - and now the man is leading the championship serie. Toyota, Brawn, Williams... He could have his pick - because he still has the same urge to race as he had before. Raikkonen: "more effort into next year’s car"
There is no one greater than Kimi Räikkönen! 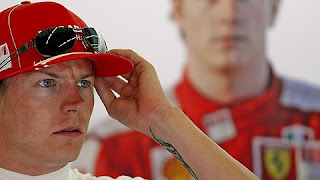 The rumours have for a long time been putting Kimi aside from Ferrari. Even if they were to become true, the WDC would probably have no problems in getting a job. Räikkönen has already proved his speed not only in F1 but also with a snow mobile and a rally car and the WRC would not mind at all if Räikkönen would in the future decide to take a more serious jump into rally. 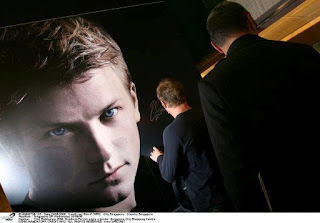 On the contrary, Räikkönen would be especially for the serie's marketing men a real dream come true. - Our serie is alive due to heros and legends and there is nothing more greater than Kimi Räikkönen, Aftonbladet told the man marketing the WRC-rally, Simon Long, had told Autosport. The union between Räikkönen and WRC isn't taken out of thin air. Räikkönen has already taken part in a few rallies. - It's no secret that I like rally. I've liked it ever since I was a little boy, Räikkönen has told earlier. In Long's papers the future of Räikkönen is quite obvious. He would like to see the Finn in a WRC-rally car more than anyone else. - My pulse reacted immediately when I just heard his name. I would like to discuss with his people and give him the best opportunities to drive WRC-rally. Kalle Takala translated by Nicole at kimiraikkonen.com/forum :). Fernando Alonso has rubbished speculation linking him yet again to the Ferrari team, saying he is not even in talks with the Italian squad. The Italian and Spanish media has this week reported that Alonso is set to drive for Ferrari in 2010, probably replacing Kimi Raikkonen if the Finn decides to pursue a career in the World Rally Championship. The Finn will make his WRC debut later this year in Rally Finland, a move the Italian press has seen as an indication that the former world champion is ready to leave F1. Renault driver Alonso, however, denied he had any contracts with Ferrari, and said he had not even talked to the team about his future. "They are only rumours. They have been happening in the last four or five years," Alonso told reporters in Germany. When asked if he had been talking to Ferrari or if you had a Ferrari contract, he said: "No, and no." Alonso did admit having a competitive car will be an important factor in deciding where his future lies. "It is important, but it is not the end of the world," he said. "I am missing winning - there are no doubts. I want to win and to have a performing car as soon as possible, but I also understand that this is sport and it happens everywhere – not only in motor racing. "It happens in tennis, it happens in NBA, in football. Sometimes you go up and down in your career. In motorsport, it is even more important to have the car and the package. "We saw with Michael (Schumacher), maybe the greatest driver ever, two world championships in Benetton and then five years in Ferrari waiting because this is not only the human part, it is also the team and the package. So, I put myself in that part of my career, in stand by, and I am preparing myself very strong physically and mentally." The two-time champion is yet to finish on the podium this season with Renault and is down in ninth place in the standings. Ferrari has also struggled this year, having scored just one podium finish in eight races. With just 26 points and one podium after eight races, Ferrari have endured a difficult first half of the season and are 65 points shy of where they were this time last year. For driver Kimi Raikkonen the time has come to admit a win will be highly unlikely at this weekend's German Grand Prix and a podium finish will be his real target. “Realistically this year our objective can’t be a win,” said Raikkonen on Ferrari’s official website. “We still have to make up ground compared to the leaders as far as performance is concerned. It’s always difficult making predictions and promising something to the fans, but for us today a place on the podium is already a good result, considering that we’ve been there just once this year. At the previous round, June’s British Grand Prix, the Finn qualified in ninth and finished one place higher in eighth to score a point. But after crossing the line over a minute down on the victorious Red Bull of Sebastian Vettel, the Italian team had little reason to celebrate and have been back at their Maranello factory seeking to improve the errant F60 ahead of this weekend’s German event. While his faith in his car’s suitability for the Nurburgring may prove well founded, Raikkonen’s record in Germany leaves a lot to be desired. Despite scoring pole on four occasions, he has never won on German soil, and with his declared objectives for this weekend's race, it doesn't look like he will remedy this in 2009. TAG Heuer extends heartfelt congratulations to its star ambassadors, tennis great Maria Sharapova and Formula One driving ace Kimi Räikkönen, after their stellar performances this weekend. On Saturday, Maria moved up to number three in the world by beating Belgium's Justine Henin-Hardenne 6-4 6-4 in the U.S. Open women's final. The next day, Kimi Räikkönen’s Team McLaren-Mercedes racing car finished just 8 seconds behind Michael Schumacher’s Ferrari at Monza. Maria’s stunning victory is a great capper to a perfect summer. The 19-year-old Russian beauty has now bested the top three players in the world: the No. 1 Amélie Mauresmo in the US Open semifinals; the No. 2 Henin-Hardenne on Saturday night; and the No. 3 Kim Clijsters to win the Acura Classic tournament in San Diego in August. Her victory in New York is her second grand slam title; a TAG Heuer Brand Ambassador since 2005, she won Wimbledon in 2004. Kimi’s second-place finish in the Italian Grand Prix brings his five-year career total with Team McLaren-Mercedes to nine Grand Prix victories, ten pole positions and a total of 321 World Championship points. The two-time F1 vice-champion, now in fourth place overall, has been a TAG Heuer Ambassador since joining Team McLaren-Mercedes five years ago. 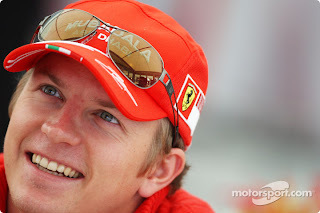 He will be joining Ferrari Team in 2007. TAG Heuer is very proud of Maria and Kimi’s extraordinary achievements. The two Brand Ambassadors are closely involved with the design and promotion of TAG Heuer’s iconic series of F1 watches and Carrera chronographs. Like fellow Tag Heuer Ambassadors—which include golfing number one Tiger Woods —these superlative athletes embody glamour and elegance, and with their latest success personify the core values of passion, prestige and performance that have kept the brand at the cutting edge of Swiss watchmaking prowess since 1860. Nürburgring is a track where Kimi Räikkönen has had to experience his career's most bitter DNF's. One could say that he has lost in these 4 DNF's three victories and at least one championship. Twice he has had to stop from a clear leading position. On top of that Ferrari's only pole man got in 2007 beaten by rain and when trying to get back he had to stop the race from 3rd postion due to a technical problem. Still he won the championship. – Kimi has has his share of unfortune on certain tracks but Nürburgring has to be his most unfortunate track. The track suits him perfectly but there has always been problems with the car when he is succeeding, Steve Robertson sighs. Räikkönen has been in Nürburgring twice on pole (2003 and 2007) and once 2nd (2005). Yet he has only got one 3rd (2002), one 4th (2006) and one 10th position (2001). In 2003 Räikkönen started from pole and got immediately a 25 second lead when he had a DNF. 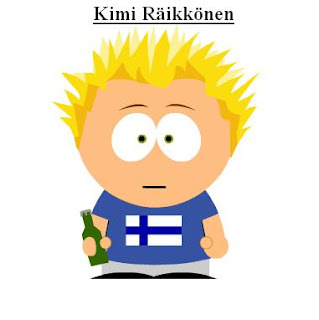 If Kimi would have won that race he would have most probably become the youngest ever WDC. Michael Schumacher won the WDC with 2 points. In 2005 Räikkönen had won before Nürburgring in Barcelona and Monaco. While overtaking Jacques Villeneuve he braked so that his front tyre became a cube which made McLaren shake so much that the differential broke when the last lap started. That took also away his hopes for the WDC. Räikkönen believes himself that he drove his career's best GP in Nürburgring. – Maybe the all time best is 2003 Nürburgring. I was easily leading the race from pole until the car broke down. Until that there was this feeling that I couldn't have done anything any better, Räikkönen admits to Turun Sanomat. – If you think of it as a whole then my last victory in Spain 2008 must have been my best weekend. It went right in the tube from the beginning to the end, Räikkönen said. What makes Nürburgring especially good for Kimi? – Kimi is always good in certain chicanes and there's two of those left-right-areas where he is really fast. Kimi is at his best when you have to change the direction quickly, Robertson said. Ferrari brought to Silverstone a highly renewed aero package and a lot more was expected than the GP could give. To Nürburgring they bring an even lighter aero package but the short axle distance is still maintained. According to Italian sources they have even found something new and interesting about the KERS-system. – The team has been working really hard again since the last race. I would think that Nürburgring would suit our car at lest better than it suited Silverstone. We'll see then where we are when we get to drive the practise. – There ain't any other goal except that I'll do my best in every race. The podium would be a cool thing because we only have one 3rd place from this year. But it's best not to promise anything beforehand, Kimi says. Hockenheim: 5 DNF's (2001, 2002, 2003, 2004, 2005). Nürburgring: 4 DNF's (2003, 2004, 2005 ja 2007). Barcelona: 4 DNF's (2002, 2003, 2007 ja 2009). Sepang: 4 DNF's (2001, 2002, 2004, 2006). Indianapolis: 4 DNF's (2001, 2002, 2005, 2006). Rümlang, 5 September 2005: Who can beat KIMI? The TAG Heuer ambassador KIMI RÄIKKÖNEN from the Mercedes McLaren team launched an unusual challenge at the TAG Heuer event at the Rümlang kart circuit in Switzerland. In front of 200 spectators, the Finn gave his utmost to complete a circuit in an electric racing kart in just 23.278 seconds. 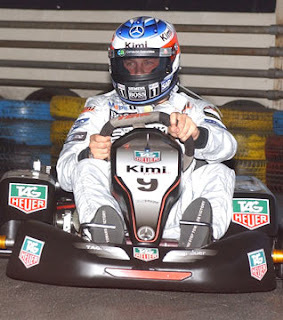 Ever ready to surprise us, Kimi also managed to complete a lap in 28.679 seconds in a simple rental kart. Around 50 winners of the TAG Heuer competition raced against the champion, 2nd in the F1 World Championship ranking. After detailed instructions from the TAG Heuer ambassador Sébastien Buemi (17), one of the most promising young hopefuls of Swiss motor racing, Kimi’s challengers were all ready to take on the mighty Finn! On January 25th, Kimi and Jenni Räikkönen, one of the most glamorous couples in professional motor sports, took part in their first joint advertising campaign, a candid TAG Heuer photo session with famous master photographer Claudio Carpi. 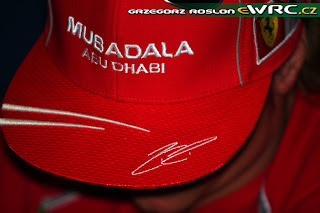 to the world "What he is made of" by becoming Formula One World Champion in 2007! Runner-up in 2003 and 2005, the “Iceman” is legendary for his cool poise and competitive drive. The new campaign reveals a different side of the Scuderia Ferrari driver. For the first time, Kimi is shown in an advertising campaign with his wife, Jenni, a top fashion model and former Miss Scandinavia. Shot in and around the Räikkönens’ stunning home in Zurich, Switzerland, the photos provide a compelling glimpse into the glamorous couple’s private world. Captured by Claudio Carpi, best known for his celebrity portraits for Vanity Fair (Nathalie Portman, Daniel Craig, Nicole Kidman, George Clooney, etc. 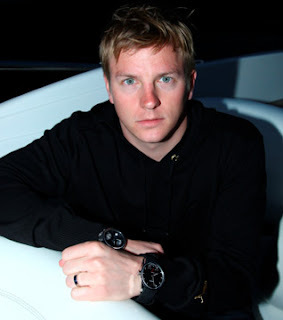 ), the photos will be used in forthcoming TAG Heuer launches of special Kimi Räikkönen eyewear and sports watch editions. Intimate, casual and glamorous, they are among the most candid shots of the longtime TAG Heuer Ambassador ever seen, and will change forever the public’s perception of the Iceman by revealing an unexpected B side. Since joining TAG Heuer in 2002, Kimi, who recently extended his long-term contract with the Swiss watchmaking legend, has been actively involved in designing and developing TAG Heuer Sports watches and TAG Heuer Avant-Garde Eyewear. To commemorate Kimi’s extraordinary, come-from-behind performance in last year’s F1 Championship, TAG Heuer is launching its most ambitious Iceman-inspired rollout ever. In the spring of 2008, TAG Heuer will launch new Kimi Räikkönen sunglasses, followed by a “Limited Edition Kimi Räikkönen sports watch” in the fall of 2008. TAG Heuer Australia New Zealand and Global Company CEO Jean-Christophe Babin hosted a spectacular event and party last night in Melbourne’s trendiest harbor development, where more than 300 media representatives, retailers and VIPs gathered to welcome and honor Brand ambassador and 2007 Formula 1 world champion Kimi Räikkönen. 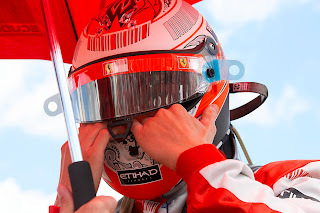 It was Kimi's first appearance since he became F1 world champion with his Ferrari F2007 in Sao Paolo last October. Kimi, who has been partnering TAG Heuer since 2002 in developing high-tech advanced design timepieces as well as sunglasses, arrived at the venue in grand style at the wheel of a brand-new 612 HP red Ferrari 599 GT. On his wrist was a Grand Carrera Calibre 17 Chronograph, perfectly matching the GT spirit of his red supercar. He was interviewed by two major TV channels and then attended a Press Conference where he was interviewed directly by TAG Heuer’s CEO. After the media interviews, he joined the 300 guests and received a standing ovation, before being officially presented by Jean-Christophe Babin with the new Carrera Calibre 1, a model recently introduced to the media as one of the major product launches for 2008 and soon to be released on the markets. He left the venue with both timepieces on his wrists, aptly epitomizing the TAG Heuer’s innovative DNA inspired by contemporary GT cars and traditional mechanical timepieces. The Formula 1 -season ended last weekend but the driver's work continues with media and sponsors. Ferrari's publicist Luca Colajanni is satisfied with the work Kimi Räikkönen does outside the GP's. - Kimi is extremely professional. He always obeys the schedules set with the media and the sponsors, Colajanni said to MTV3. 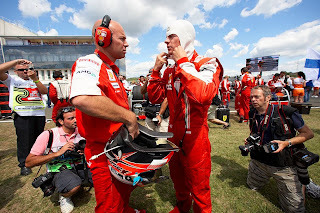 Espacially in Italy they have wondered about Kimi's taciturn. - It is true that he isn't the most voluble guy in the world. It has good sides too. When he has got something to say, he says it and doesn't play with words. I like working with Kimi. He is a nice guy, Colajanni said. 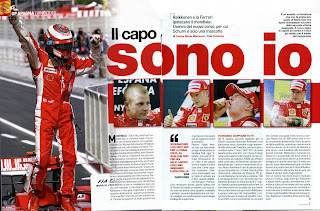 Kimi's racing performances were often criticised in the Italian press. This didn't come as a surprise to Ferrari. - This season was really difficult for him and the ciriticism only grew bigger. We could expect it because it has always been like this, Colajanni said. Ferrari's publicist spoke really highly of Kimi's honesty and genuinity. - The picture you get from Kimi is real. He doesn't act. He doesn't pull a special act for the media or when he is friendly to people. Even though he would be in a bad mood he would act professionally. There is nothing to improve, Colajanni assured. The people behind Fernando Alonso did everything they could to disturb the peace at Ferrari. The Spanish media kept on believing untill the very end that Ferrari absolutely wants Alonso and were trying to swap Kimi Räikkönen to replace him at Renault. Even as late as Brazil the Spanish sources were trying to spread a rumour on the paddock that Alonso has been adviced not to commit to anything, because Ferrari is about to fire Räikkönen after the Brazilian Grand Prix. The groundwork was layed during the summer, when the Spanish media claimed that Santander, the Spanish bank, is about to end it's contract with McLaren and start backing Ferrari. The rumour was that Santander will pay for Räikkönen's release and Alonso's salary as well. The reality was that Santander extended it's contract with the British team and are now milking Hamilton's championship for all it's worth. In Italy, Ferrari chief Luca di Montezemolo gave comments to the La Repubblica newspaper in order to elaborate on their driver policy. - It's not a question of whether we have respect for Alonso or not, or any other driver, but we have the drivers we want. And we are continuing with them. Anything else is a fantasy, and I hope these stories will finally come to an end. We don't want to change a winning team, and we did win a championship in the end. Earlier di Montezemolo had made clear that Ferrari had already made their choice between Räikkönen and Alonso four years ago - and not based on anything that happened this past season. 90 crews had registered their intention to participate in Neste Oil Rally Finland at the close of entries. That is the highest number so far in any WRC qualifying round this year. The number of World Rally Cars in the list also equals this season´s record. There are 18 World Rally Cars among the entries and 25 different nationalities are represented altogether. All the teams signed for WRC are in the list, of course, led by championship rivals Mikko Hirvonen and Sebastian Loeb. A surprise addition is up-and-coming Finn Matti Rantanen, who has been nominated as a points-scoring driver for Munchi´s Ford WRT. 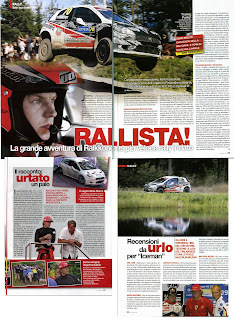 Rantanen will be driving a Ford Focus WRC. Another surprise is the entry of Formula 1 World Champion Kimi Räikkönen, making his debut on this level. 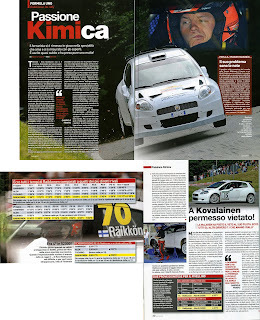 Like in his earlier rally outings Kimi will be driving an Abarth Grande Punto and is accompanied by Kaj Lindström. Further spice to the production category will be come from Juho Hänninen in a Skoda Fabia S2000. 10 drivers are chasing JWRC points in Finland, among their number a "Wild Card" entry for Kalle Pinomäki. There are also nine Ford Fiesta Sport Trophy International contestants and five FIA Pirelli Star Drivers, headed by local favourite Jarkko Nikara.